If you like a bit of crunch in your porridge then this is the one for you. A lovely nutty and creamy texture sweetened with a scoop of delicious honey. Surprise! honey pot inside. Howlin' good - from dawn 'til dusk. 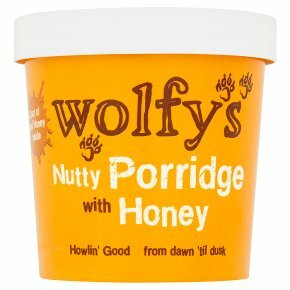 Vegetarian Society approved.At Wolfy's: We really love porridge and the creamier and tastier the better. Which is why our Nutty Porridge is made with rolled oats, whole milk and a delicious pot of Honey from award winning preserve makers Kitchen Garden. Preparation: To prepare your porridge, remove the lid, the pot of honey and the cardboard insert (which can be used to hold the hot pot) and pour in boiling water to the fill line (or just above or below - you choose how thick you like your porridge). Stir thoroughly and replace the lid for 4 minutes. Then scoop, tip, pour or blob in the honey, stir again and tuck in. Warning - may contain pieces of nut shell.